The concept of ‘live’ has changed as a consequence of mediated culture. Interaction may occur in real time, but not necessarily in shared physical spaces with others. The Digital Evolution of Live Music considers notions of live music in time and space as influenced by digital technology. 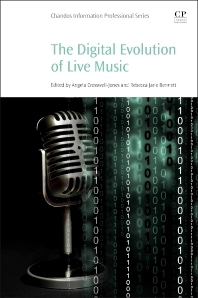 This book presents the argument that live music is a special case in digital experience due to its liminal status between mind and body, words and feelings, sight and sound, virtual and real. Digital live music occupies a multimodal role in a cultural contextual landscape shaped by technological innovation. The book consists of three sections. The first section looks at fan perspectives, digital technology and the jouissance of live music and music festival fans. The second section discusses music in popular culture, exploring YouTube and live music video culture and gaming soundtracks, followed by the concluding section which investigates the future of live music and digital culture. All those interested in the way digital technology is changing cultural interaction and pursuit. Angela Jones is a lecturer at Murdoch University, Australia. She completed her PhD in Cultural Studies in 2007, and has published book chapters and magazine articles that focus on youth, culture, and the Internet. Angela’s current research interests include popular culture and the Internet, digital literacy and education, social media strategy, social media and identity, and online communities. She previously published The Host in the Machine, also with Chandos. Rebecca Jane Bennett is a Lecturer in Academic Language and Literacy at Murdoch University in Australia. With a PhD in Communications and Cultural Studies, she has published book chapters and journal articles on backpacker discourse, tourist weblogs, local music culture and intercultural communication. She also has significant experience tutoring and lecturing. Her research interests include digital literacy, popular culture studies, youth studies and intercultural communication.